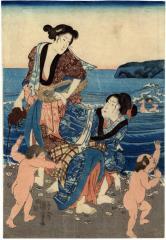 This is the center panel of a triptych by Kuniyoshi. One can tell, from this image alone, what a successful outing these women and children have had. The woman who is standing up is holding a large lobster, an ebi, in her right hand. The basket she is holding with her left hand has fish in it. The woman who is stooping down is looking back at the other woman and offering her a shell, possibly an oyster. The publisher is probably Tsutaya Umejirō, based on the seal of left left-hand panel of the triptych.